Advertorial marketing, public relations and social media. "To market your product, you've got to have a story, and motorsports gives you that story with exciting visuals and experiences," says Jho. 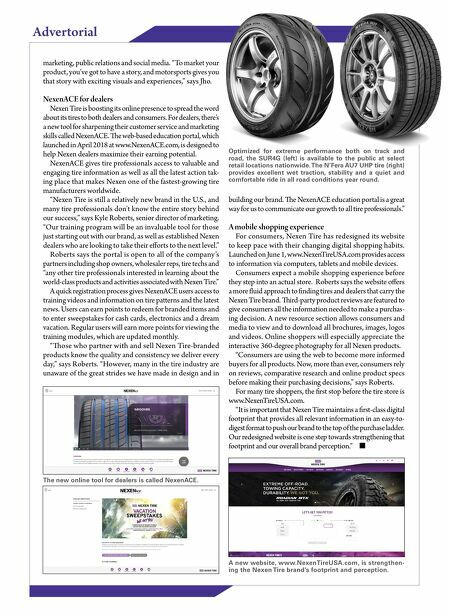 NexenACE for dealers Nexen Tire is boosting its online presence to spread the word about its tires to both dealers and consumers. For dealers, there's a new tool for sharpening their customer service and marketing skills called NexenACE. e web-based education portal, which launched in April 2018 at www.NexenACE.com, is designed to help Nexen dealers maximize their earning potential. NexenACE gives tire professionals access to valuable and engaging tire information as well as all the latest action tak- ing place that makes Nexen one of the fastest-growing tire manufacturers worldwide. 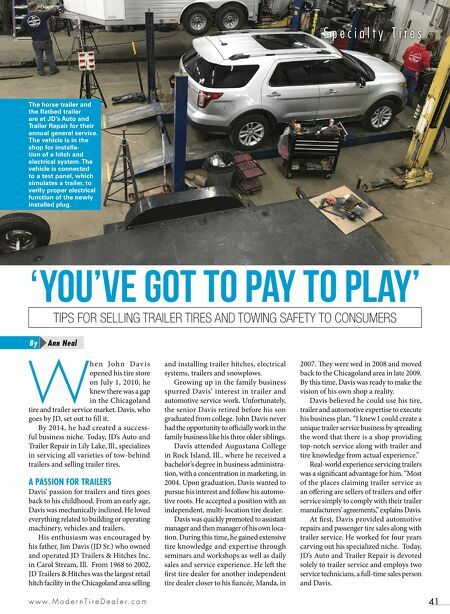 "Nexen Tire is still a relatively new brand in the U.S., and many tire professionals don't know the entire story behind our success," says Kyle Roberts, senior director of marketing. "Our training program will be an invaluable tool for those just starting out with our brand, as well as established Nexen dealers who are looking to take their efforts to the next level." Roberts says the portal is open to all of the company's partners including shop owners, wholesaler reps, tire techs and "any other tire professionals interested in learning about the world-class products and activities associated with Nexen Tire." A quick registration process gives NexenACE users access to training videos and information on tire paerns and the latest news. Users can earn points to redeem for branded items and to enter sweepstakes for cash cards, electronics and a dream vacation. Regular users will earn more points for viewing the training modules, which are updated monthly. "ose who partner with and sell Nexen Tire-branded products know the quality and consistency we deliver every day," says Roberts. "However, many in the tire industry are unaware of the great strides we have made in design and in building our brand. e NexenACE education portal is a great way for us to communicate our growth to all tire professionals." A mobile shopping experience For consumers, Nexen Tire has redesigned its website to keep pace with their changing digital shopping habits. Launched on June 1, www.NexenTireUSA.com provides access to information via computers, tablets and mobile devices. Consumers expect a mobile shopping experience before they step into an actual store. Roberts says the website offers a more fluid approach to finding tires and dealers that carry the Nexen Tire brand. ird-party product reviews are featured to give consumers all the information needed to make a purchas- ing decision. A new resource section allows consumers and media to view and to download all brochures, images, logos and videos. Online shoppers will especially appreciate the interactive 360-degree photography for all Nexen products. "Consumers are using the web to become more informed buyers for all products. Now, more than ever, consumers rely on reviews, comparative research and online product specs before making their purchasing decisions," says Roberts. For many tire shoppers, the first stop before the tire store is www.NexenTireUSA.com. "It is important that Nexen Tire maintains a first-class digital footprint that provides all relevant information in an easy-to- digest format to push our brand to the top of the purchase ladder. Our redesigned website is one step towards strengthening that footprint and our overall brand perception." ■ Optimized for extreme performance both on track and road, the SUR4G (left) is available to the public at select retail locations nationwide. The N'Fera AU7 UHP tire (right) provides excellent wet traction, stability and a quiet and comfortable ride in all road conditions year round. The new online tool for dealers is called NexenACE. A new website, www.NexenTireUSA.com, is strengthen- ing the Nexen Tire brand's footprint and perception.